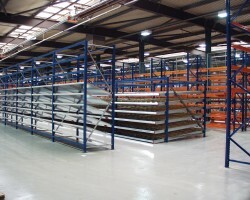 Carton Live Shelving system offers a solution for parts or order picking applications. This provides a fast and efficient picking system utilising FIFO storage (first in, first out) and condensed pick faces. This system can be easily installed and / or re-configured to suit all types and sizes of product ranges. Carton Live Storage has applications in material handling, production line side assembly, distribution and order fulfillment centres, cell-feed systems, and other order picking activities. Contact Hampshire Mezzanine Floors to discuss your requirements, being a new installation or adding to existing carton Live Installations.